Oh Nicole you have made sooooooooo much progress and it is so pretty too! 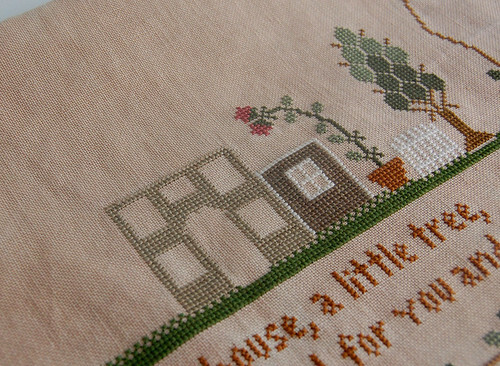 I think I need to have you teach me how to stitch so much so fast and so beautiful! Awesome! Sorry those darn frogs found you, but you have still made remarkable progress. Nicole! You are really fast even though a frog came to you, and your stitching is very beautiful!! As seeing your beautiful piece, I feel like stitching this more and more!! I'm very looking forward to seeing more of your wonderful progress! You are making such great progress, Nicole. Congratulations! great progress for your neighborhood. The colour of the house goes along beautifully with the fabric you used.Great choice. I'm so eager to start mine too. Good to see your beautiful stitches! I thought Susan was fast, but I think you take the cake.